Hubble spotted a wayward spiral galaxy losing its gas as it plunges toward the center of the massive cluster and is roughed up as it plows through the intergalactic medium. Telltale evidence lies in a long, thin streamer of material that is stretching like taffy from the galaxy's core and on into intergalactic space. Gas is the lifeblood of a galaxy, fueling the birth of new stars. Once it is stripped of all of its gas, the galaxy, named D100, will enter retirement and shine only by the feeble glow of its aging, red stars. D100 is being stripped of its gas because of the gravitational tug of a grouping of giant "bully" galaxies in the crowded cluster. Their combined gravity is pulling the beleaguered galaxy toward the cluster's center. As D100 falls toward the core, the galaxy barrels through material. This action forces gas from the galaxy. The gas-stripping process in D100 began roughly 300 million years ago. In the massive Coma cluster this violent gas-loss process occurs in many galaxies. But D100 is unique in several ways. 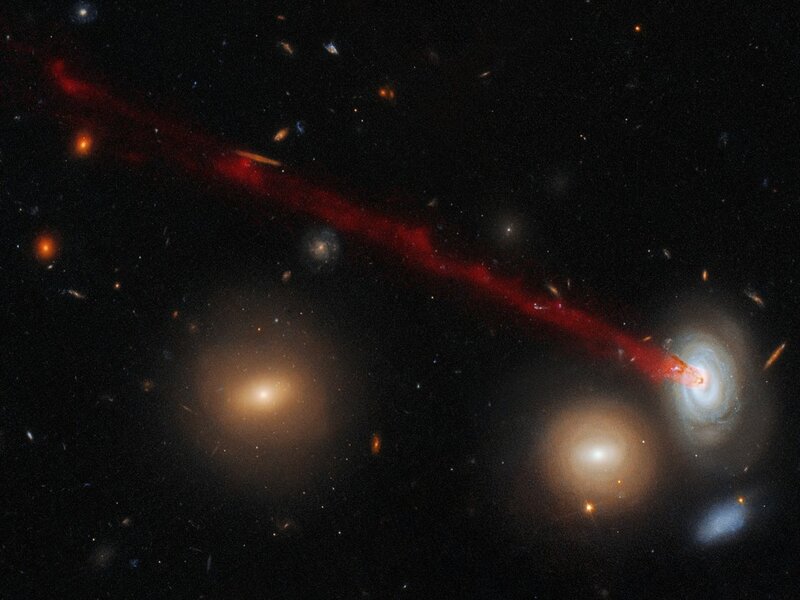 Its long, thin tail is its most unusual feature extending nearly 200,000 light-years. But the pencil-like structure is comparatively narrow, only 7,000 light-years wide. Thankfully, our Milky Way galaxy lives in a sparsely populated small corner of the universe, with only one other big galaxy as a companion. Credit: ESA/Hubble & NASA, Subaru, Cramer et al. This striking image combines data gathered with the Advanced Camera for Surveys (ACS), installed on the NASA/ESA Hubble Space Telescope and data from the Subaru Telescope in Hawaii. It shows just a part of the spectacular tail emerging from a spiral galaxy nicknamed D100. Tails such as these are created by a process known as ram-pressure stripping. Despite appearances, the space between galaxies in a cluster is far from empty; it is actually filled with superheated gas and plasma, which drags and pulls at galaxies as they move through it, a little like the resistance one experiences when wading through deep water. This can be strong enough to tear galaxies apart, and often results in objects with peculiar, bizarre shapes and features — as seen here. D100’s eye-catching tail of gas, which stretches far beyond this image to the left, is a particularly striking example of this phenomenon. The galaxy is a member of the huge Coma cluster. The pressure from the cluster’s hot constituent plasma (known as the intracluster medium) has stripped gas from D100 and torn it away from the galaxy’s main body, and drawing it out into the plume pictured here. Densely populated clusters such as Coma are home to thousands of galaxies. They are thus the perfect laboratories in which to study the intriguing phenomenon of ram-pressure stripping, which, as well as producing beautiful images such as this, can have a profound effect on how galaxies evolve and form new generations of stars.